Dog: Oria (which means Golden Wind in Greek) because she runs like the wind.Oria is trained through “Therapy Dogs International” by her owners, David and Carol Butler with whom she lives with in rural Bluffton. 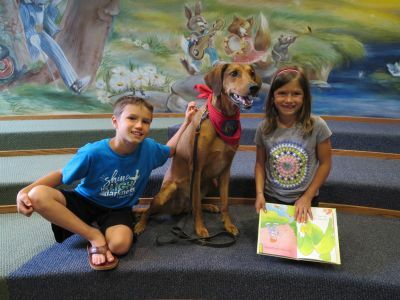 Oria will be in the Story Hour Room at the Main Library in Bluffton on Monday mornings at 10:30 and Thursday evenings at 6:30 during the summer (with the exception of July 3), as part of the Tail Waggin’ Tutors program. Children can come and read to Oria for fifteen minutes, for both fun and to help gain confidence in their reading. It will count toward their requirements for the Summer Reading Program or they can just practice their reading this summer, since Oria is a very sweet and patient listener. Call the library at 260-824-1612 and ask for the Children’s Room to set up a time to read to Oria. We will also work “drop-ins” in to the schedule. PreviousPrevious post:Manga Club Rescheduled for July 10thNextNext post:Teen Summer Reading Program Party Friday, July 28.